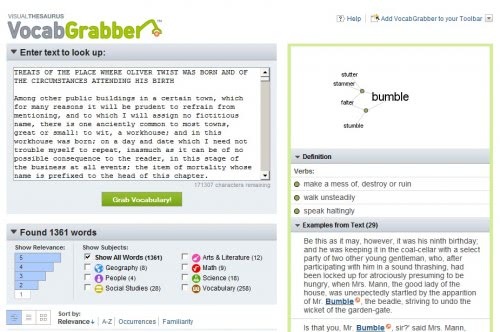 VocabGrabber is an interesting online service provided by Visual Thesaurus. The online tool can be used to analyze text that can consist of up to 200000 characters. All that needs to be done is to copy and paste text into the form on the Visual Thesaurus website to receive an in depth analysis of the text. The online service will compute a list of words that have been found in the text and categorize them in multiple ways. The words are for example sorted by relevancy and subject. A click on any word will also display the relationship to other words in the text, a definition of the word and example usage from the text. A word cloud is displayed that is showing all words that have been discovered in the text. It is possible to filter words by relevancy or subject which can reduce the amount of words quite a bit. The subject filter is interesting as it displays word that fall into subjects such as math, science or art. VocabGrabber has been designed to create a vocabulary list which can be a great help to understand and learn the text that has been pasted into the web form. It is currently only working with text that has been written in English. For some words and phrases, definitions are shown right on the page. For some, none are found which means you may need a dictionary at hand to find out what they are all about. The service furthermore displays related terms visually on the screen, so that you can click on them directly to find out more about those terms as well. Examples of the text are provided which put the words and phrases into context. It is sometimes possible to understand the meaning of the word when you see the context it has been used in. Thanks your post , very good website.